A guided tour that will allow us to see the most important buildings and museums of the historic center, declared a World Heritage Site by Unesco in 1998, while enjoying the tasting of one of the most famous gastronomic specialties of the city: tapas . 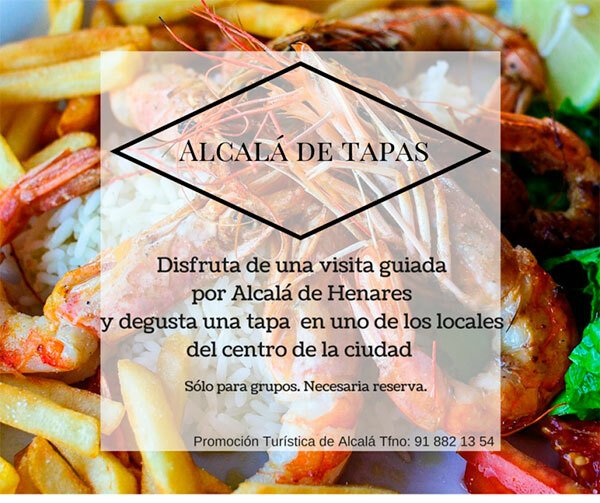 The Cervantes cuisine, renewed and presented in the form of the best tapas, is always the best complement when it comes to knowing Alcalá de Henares. Interiors: University, Birthplace of Cervantes, Chapel of the Oidor, former Students’ Hospice, Regional Archaeological Museum (mosaic area). Tapas tasting: Stop half an hour for tasting tapas in an restaurant in the historical center. Outdoors: Archbishop Palace, Main Street, Cervantes Square, San Diego Square and facade of the University.